I spent the morning going through my stockpile of Everyday Food, Bon Appetit, and Cooking Light. I've been saving these treats until I had more time to savor them, and I finally did today. While I was poring through the magazines, getting hungrier and hungrier for lunch, I saw a recipe for peanut noodles and HAD to have some, stat! 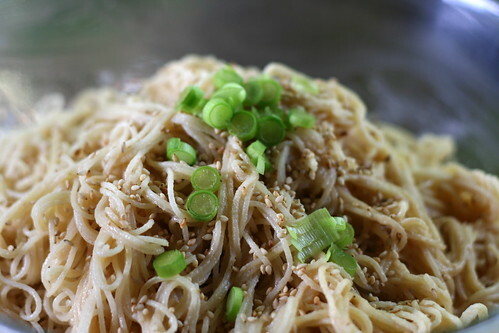 Since I didn't have any of the ingredients on hand, though, I decided to make up my own recipe for sesame noodles instead. The green onion is from our garden! Cook pasta according to package directions. In a small bowl, whisk together sauce ingredients, adding water to thin as necessary. Play with the ingredient proportions until you're happy with the flavor and consistency. Toss sauce with pasta and top with garnishes. Another yummy dish I will have to make! Thanks!!! Those sesame noodles look good!